Neurological Walker with variable height adjustments. Solid construction of the walker equipped with 4 directional wheels. The lower limbs are relieved by supporting the body with upholstered brackets. Vertimo are Meden-Inmed’s high-tech verticalisation tables. Classic, Hi-Lo and Hi-Lo Step (meant for cardiological rehabilitation) are the three available models. 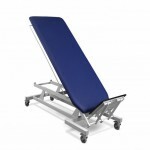 Every treatment is safe and effective due to railings and stabilisation belts which are parts of every model. Thanks to PIO walking simulator the patient’s posture can get physiologically correct and adapted to almost natural weight of the musculoskeletal system. Terapueta B are 1- or 2-section therapy tables meant for children neurological rehabilitation, when using reflex locomotion or Bobath concept. When treating mostly children with central nervous system chronic diseases or injuries, thanks to these tables, safety and comfortable work are guaranteed. 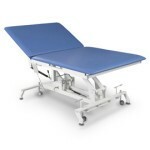 Terapeuta B tables are very mobile, as they have 4 legs and 4 wheels.